These highlights do not include all the information needed to use YUPELRI™ (revefenacin) inhalation solution safely and effectively. See full prescribing information for YUPELRI (revefenacin) inhalation solution. YUPELRI (revefenacin) inhalation solution is an anticholinergic indicated for the maintenance treatment of patients with chronic obstructive pulmonary disease (COPD). For oral inhalation use only. Do not swallow YUPELRI. YUPELRI (revefenacin) inhalation solution is indicated for the maintenance treatment of patients with chronic obstructive pulmonary disease (COPD). The recommended dose of YUPELRI (revefenacin) inhalation solution is one 175 mcg unit‑dose vial administered once daily by nebulizer using a mouthpiece. YUPELRI should be administered by the orally inhaled route via a standard jet nebulizer connected to an air compressor (See Medication Guide). The safety and efficacy of YUPELRI have been established in clinical trials when administered using the PARI LC® Sprint nebulizer with a mouthpiece and the PARI Trek® S compressor. The safety and efficacy of YUPELRI delivered from non‑compressor based nebulizer systems have not been established. The YUPELRI unit-dose vial should only be removed from the foil pouch and opened IMMEDIATELY BEFORE USE. The vial and any residual content should be discarded after use. No dosage adjustment is required for geriatric patients, or patients with renal impairment [see Clinical Pharmacology (8.5, 8.7, 12.3)]. The drug compatibility (physical and chemical), efficacy, and safety of YUPELRI when mixed with other drugs in a nebulizer have not been established. YUPELRI (revefenacin) inhalation solution is supplied as a sterile, clear, colorless, aqueous solution for nebulization in low-density polyethylene unit-dose vials. Each vial contains 175 mcg of revefenacin in 3 mL of aqueous solution. YUPELRI is contraindicated in patients with hypersensitivity to revefenacin or any component of this product. YUPELRI should not be initiated in patients during acutely deteriorating or potentially life-threatening episodes of COPD. Revefenacin has not been studied in subjects with acutely deteriorating COPD. The initiation of revefenacin in this setting is not appropriate. YUPELRI is intended as a once-daily maintenance treatment for COPD and should not be used for relief of acute symptoms, i.e. as rescue therapy for the treatment of acute episodes of bronchospasm, and extra doses should not be used for that purpose. Acute symptoms should be treated with an inhaled, short-acting beta2-agonist. COPD may deteriorate acutely over a period of hours or chronically over several days or longer. If YUPELRI no longer controls symptoms of bronchoconstriction, the patient's inhaled, short-acting beta2-agonist becomes less effective, or the patient needs more inhalations of a short-acting beta2-agonist than usual, these may be markers of deterioration of disease. In this setting, a re-evaluation of the patient and the COPD treatment regimen should be undertaken at once. Increasing the daily dose of YUPELRI beyond the recommended dose is not appropriate in this situation. As with other inhaled medicines, YUPELRI can produce paradoxical bronchospasm that may be life-threatening. If paradoxical bronchospasm occurs following dosing with YUPELRI, it should be treated immediately with an inhaled, short-acting bronchodilator; YUPELRI should be discontinued immediately and alternative therapy should be instituted. YUPELRI should be used with caution in patients with narrow-angle glaucoma. Prescribers and patients should be alert for signs and symptoms of acute narrow-angle glaucoma (e.g. eye pain or discomfort, blurred vision, visual halos or colored images in association with red eyes from conjunctival congestion and corneal edema). Instruct patients to consult a physician immediately if any of these signs or symptoms develops. YUPELRI should be used with caution in patients with urinary retention. Prescribers and patients should be alert for signs and symptoms of urinary retention (e.g. difficulty passing urine, painful urination), especially in patients with prostatic hyperplasia or bladder-neck obstruction. Instruct patients to consult a healthcare provider immediately if any of these signs or symptoms develops. Immediate hypersensitivity reactions may occur after administration of YUPELRI. If such a reaction occurs, therapy with YUPELRI should be stopped at once and alternative treatments should be considered. The revefenacin safety database included 2,285 subjects with COPD in two 12-week efficacy studies and one 52-week long-term safety study. A total of 730 subjects received treatment with revefenacin 175 mcg once daily. The safety data described below are based on the two 12-week trials and the one 52-week trial. YUPELRI was studied in two 12-week replicate placebo-controlled trials in patients with moderate to very severe COPD (Trials 1 and 2). In these trials, 395 patients were treated with YUPELRI at the recommended dose of 175 mcg once daily. The population had a mean age of 64 years (range from 41 to 88 years), with 50% males, 90% Caucasian, and had COPD with a mean post-bronchodilator forced expiratory volume in one second (FEV1) percent predicted of 55%. Of subjects enrolled in the two 12-week trials, 37% were taking concurrent LABA or ICS/LABA therapy. Patients with unstable cardiac disease, narrow-angle glaucoma, or symptomatic prostatic hypertrophy or bladder outlet obstruction were excluded from these trials. Table 1 shows the most common adverse reactions that occurred with a frequency of greater than or equal to 2% in the YUPELRI group and higher than placebo in the two 12‑week placebo controlled trials. The proportion of subjects who discontinued treatment due to adverse reactions was 13% for the YUPELRI-treated subjects and 19% for placebo-treated subjects. Other adverse reactions defined as events with an incidence of ≥1.0%, less than 2.0%, and more common than with placebo included the following: hypertension, dizziness, oropharyngeal pain and bronchitis. YUPELRI was studied in one 52-week open-label active control (tiotropium 18 mcg once daily) trial in 1,055 patients with COPD. In this trial, 335 patients were treated with YUPELRI 175 mcg once daily and 356 patients with tiotropium. The demographic and baseline characteristics of the long-term safety trial were similar to those of the placebo-controlled 12-week studies described, with the exception that concurrent LABA or LABA/ICS therapy was used in 50% of patients. The adverse reactions reported in the long-term safety trial for YUPELRI were consistent with those observed in the placebo controlled studies of 12-weeks. There is potential for an additive interaction with concomitantly used anticholinergic medicines. Therefore, avoid coadministration of YUPELRI with other anticholinergic-containing drugs as this may lead to an increase in anticholinergic adverse effects [see Warnings and Precautions (5.3, 5.4)]. OATP1B1 and OATP1B3 inhibitors (e.g. rifampicin, cyclosporine, etc.) could lead to an increase in systemic exposure of the active metabolite. Therefore, coadministration with YUPELRI is not recommended [see Clinical Pharmacology (12.3)]. There are no adequate and well-controlled studies with YUPELRI in pregnant women. Women should be advised to contact their physician if they become pregnant while taking YUPELRI. In animal reproduction studies, subcutaneous administration of revefenacin to pregnant rats and rabbits during the period of organogenesis produced no evidence of fetal harm at respective exposures approximately 209 times the exposure at the maximum recommended human dose (MRHD) (on an area under the curve [AUC] basis) (see Data). In an embryo‑fetal development study in pregnant rats dosed during the period of organogenesis from gestation days 6 to 17, revefenacin was not teratogenic and did not affect fetal survival at exposures up to 209 times the MRHD (based upon summed AUCs for revefenacin and its active metabolite at maternal subcutaneous doses up to 500 mcg/kg/day). In an embryo‑fetal development study in pregnant rabbits dosed during the period of organogenesis from gestation days 7 to 19, revefenacin was not teratogenic and did not affect fetal survival at exposures up to 694 times the MRHD (based upon summed AUCs for revefenacin and its active metabolite at maternal subcutaneous doses up to 500 mcg/kg/day). Placental transfer of revefenacin and its active metabolite was observed in pregnant rabbits. In a pre- and postnatal development (PPND) study in pregnant rats dosed during the periods of organogenesis and lactation from gestation day 6 to lactation day 20, revefenacin had no adverse developmental effects on pups at exposures up to 196 times the MRHD (based upon summed AUCs for revefenacin and its active metabolite at maternal subcutaneous doses up to 500 mcg/kg/day). There is no information regarding the presence of revefenacin in human milk, the effects on the breastfed infant, or the effects on milk production. However, revefenacin was present in the milk of lactating rats following dosing during pregnancy and lactation (see Data). The developmental and health benefits of breastfeeding should be considered along with the mother’s clinical need for YUPELRI and any potential adverse effects on the breastfed infant from YUPELRI or from the underlying maternal condition. In a PPND study (see Section 8.1) revefenacin and its active metabolite were present in milk of lactating rats on lactation day 22. Milk-to-plasma concentration ratios were up to 10 for revefenacin and its active metabolite. YUPELRI is not indicated for use in children. The safety and efficacy in pediatric patients have not been established. Based on available data, no adjustment of the dosage of YUPELRI in geriatric patients is necessary. Clinical trials of YUPELRI included 441 subjects aged 65 years and older, and, of those, 101 subjects were aged 75 years and older. No overall differences in safety or effectiveness were observed between these subjects and younger subjects, and other reported clinical experience has not identified differences in responses between the elderly and younger patients, but greater sensitivity of some older individuals cannot be ruled out. The systemic exposure of revefenacin is unchanged while that of its active metabolite is increased in subjects with moderate hepatic impairment. The safety of YUPELRI has not been evaluated in COPD patients with mild-to-severe hepatic impairment. YUPELRI is not recommended in patients with any degree of hepatic impairment. [see Clinical Pharmacology (12.3)]. No dosage adjustment is required in patients with renal impairment. Monitor for systemic antimuscarinic side effects in COPD patients with severe renal impairment. [see Clinical Pharmacology (12.3)]. An overdose of YUPELRI may lead to anticholinergic signs and symptoms such as nausea, vomiting, dizziness, lightheadedness, blurred vision, increased intraocular pressure (causing pain, vision disturbances, or reddening of the eye), obstipation or difficulties in voiding. 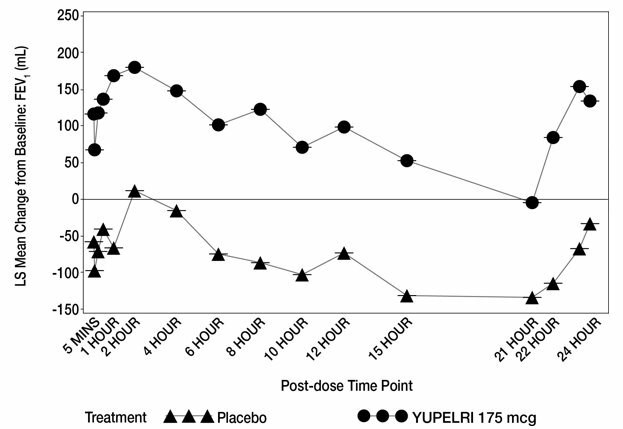 In COPD patients, orally inhaled administration of YUPELRI at a once-daily dose of up to 700 mcg (4 times the maximum recommended daily dose) for 7 days was well tolerated. Treatment of overdosage consists of discontinuation of YUPELRI along with institution of appropriate symptomatic and/or supportive therapy. Revefenacin has a molecular weight of 597.76 and its empirical formula is C35H43N5O4. Revefenacin is a white to off-white crystalline powder and is slightly soluble in water. YUPELRI is supplied as 3 mL of revefenacin solution packaged in a unit-dose low-density polyethylene vial overwrapped in a foil pouch. Each vial contains 175 mcg of revefenacin in 3 mL of an isotonic, sterile aqueous solution containing sodium chloride, citric acid, sodium citrate, and water for injection at pH 5.0. YUPELRI does not require dilution prior to administration by nebulization. Like all other nebulized treatments, the amount delivered to the lungs will depend on patient factors, the nebulization system used, and compressor performance. Using the PARI LC® Sprint nebulizer connected to a PARI Trek® S compressor under in vitro conditions, the mean delivered dose from the mouthpiece was approximately 62 mcg (35% of label claim), at a mean flow rate of 4 LPM. The mean nebulization time was 8 minutes. YUPELRI should only be administered via a standard jet nebulizer connected to an air compressor with an adequate airflow, and equipped with a mouthpiece. Revefenacin is a long-acting muscarinic antagonist, which is often referred to as an anticholinergic. It has similar affinity to the subtypes of muscarinic receptors M1 to M5. In the airways, it exhibits pharmacological effects through inhibition of M3 receptor at the smooth muscle leading to bronchodilation. The competitive and reversible nature of antagonism was shown with human and animal origin receptors and isolated organ preparations. In preclinical in vitro as well as in vivo models, prevention of methacholine- and acetylcholine-induced bronchoconstrictive effects was dose-dependent and lasted longer than 24 hours. The clinical relevance of these findings is unknown. The bronchodilation following inhalation of revefenacin is predominantly a site-specific effect. QTc interval prolongation was studied in a randomized, double-blind, placebo- and positive‑controlled, single dose, crossover trial in 48 healthy subjects. Following a single dose of revefenacin 700 mcg (4 times the recommended dosage), no effects on prolongation of QTc interval were observed. Revefenacin pharmacokinetic parameters are presented as the mean [standard deviation (SD)] unless otherwise specified. Following repeat dosing of inhaled YUPELRI, steady-state was achieved within 7 days with <1.6‑fold accumulation. Revefenacin exposure (Cmax and AUC) in COPD patients is approximately 60% lower as compared to healthy subjects. Exposure (Cmax and AUC) of the active metabolite in COPD patients is approximately 2-fold higher as compared to healthy subjects. Revefenacin Cmax was 0.16 ng/mL (0.11) and AUC was 0.22 ng·hr/mL (0.20) at steady-state after inhaled YUPELRI 175 mcg dose in COPD patients. Cmax of the active metabolite was 0.20 ng/mL (0.13) and AUC was 0.69 ng·hr/mL (0.53) at steady-state after inhaled YUPELRI 175 mcg dose in COPD patients. Revefenacin and its active metabolite exposure increased in a slightly greater than dose proportional manner with increasing revefenacin dose. After single or multiple once-daily dosing of YUPELRI, both AUC and Cmax of revefenacin and its active metabolite increased by approximately 11-fold over the 88 to 700 mcg (8‑fold) dose range. Following inhaled administration of YUPELRI in healthy subjects or COPD patients, Cmax of revefenacin and its active metabolite occurred at the first postdose sampling time which ranged from 14 to 41 minutes after start of nebulization. The absolute bioavailability following an oral dose of revefenacin is low (<3%). Following intravenous administration to healthy subjects, the mean steady-state volume of distribution of revefenacin was 218 L suggesting extensive distribution to tissues. In vitro protein binding of revefenacin and its active metabolite in human plasma was on average 71% and 42%, respectively. The terminal half-life of revefenacin and its active metabolite after once-daily dosing of YUPELRI in COPD patients is 22 to 70 hours. In vitro and in vivo data showed that revefenacin is primarily metabolized via hydrolysis of the primary amide to a carboxylic acid forming its major active metabolite. Following inhaled administration of YUPELRI in COPD patients, conversion to its active metabolite occurred rapidly, and plasma exposures of the active metabolite exceeded those of revefenacin by approximately 4- to 6-fold (based on AUC). The active metabolite is formed by hepatic metabolism and possesses activity at target muscarinic receptors that is lower (approximately one-third to one-tenth) than that of revefenacin. It could potentially contribute to systemic antimuscarinic effects at therapeutic doses. Following administration of a single intravenous dose of radiolabeled revefenacin to healthy male subjects, approximately 54% of total radioactivity was recovered in the feces and 27% was excreted in the urine. Approximately 19% of the administered radioactive dose was recovered in the feces as the active metabolite. Following administration of a single radiolabeled oral dose of revefenacin, 88% of total radioactivity was recovered in the feces and <5% was present in urine, suggesting low oral absorption. There was minimal renal excretion (<1%) of revefenacin and its active metabolite following inhaled administration of YUPELRI in COPD patients. Population pharmacokinetic analysis showed no evidence of a clinically significant effect of age (44 to 79 years), gender (59% male), smoking status (42% current smoker) or weight (46 to 155 kg) on systemic exposure of revefenacin and its active metabolite. The pharmacokinetics of YUPELRI was evaluated in subjects with moderate hepatic impairment (Child-Pugh score of 7-9). There was no increase in Cmax of revefenacin and 1.5-fold increase in Cmax of the active metabolite. There was 1.2-fold increase in AUC of revefenacin and up to 4.7-fold increase in AUC of the active metabolite. YUPELRI has not been evaluated in subjects with severe hepatic impairment. The pharmacokinetics of YUPELRI was evaluated in subjects with severe renal impairment (CrCl <30 mL/min). There was 1.5-fold increase in Cmax of revefenacin and up to 2-fold increase in Cmax of the active metabolite. There was up to 2.3‑fold increase in AUCinf of revefenacin; the active metabolite exposure (AUCinf) was increased by up to 2.5-fold. YUPELRI has not been evaluated in subjects with end stage renal disease. Neither revefenacin nor its active metabolite inhibits the following cytochrome P450 isoforms: CYP1A2, CYP2B6, CYP2C8, CYP2C9, CYP2C19, CYP2D6, and CYP3A4/5. Neither revefenacin nor its active metabolite induces CYP1A2, CYP2B6, and CYP3A4/5. Revefenacin is a substrate of P-gp and BCRP. Neither revefenacin nor its active metabolite is an inhibitor of these efflux transporters. The active metabolite of revefenacin is a substrate of OATP1B1 and OATP1B3. Neither revefenacin nor its active metabolite is an inhibitor of the uptake transporters OATP1B1, OATP1B3, OAT1, OAT3, or OCT2. Two-year inhalation studies in Sprague-Dawley rats and CD1 mice were conducted to assess the carcinogenic potential of revefenacin. No evidence of tumorigenicity was observed in male and female rats at inhaled doses up to 338 mcg/kg/day (approximately 35 times the MRHD based upon summed AUCs for revefenacin and its active metabolite). No evidence of tumorigenicity was observed in male and female mice at inhaled doses up to 326 mcg/kg/day (approximately 40 times the MRHD based on summed AUCs for revefenacin and its active metabolite). Revefenacin and its active metabolite were negative for mutagenicity in the Ames test for bacterial gene mutation. Revefenacin was negative for genotoxicity in the in vitro mouse lymphoma assay and in vivo rat bone marrow micronucleus assay. There were no effects on male or female fertility and reproductive performance in rats at subcutaneous revefenacin doses up to 500 mcg/kg/day (approximately 30 times the MRHD on an mg/m2 basis for revefenacin). 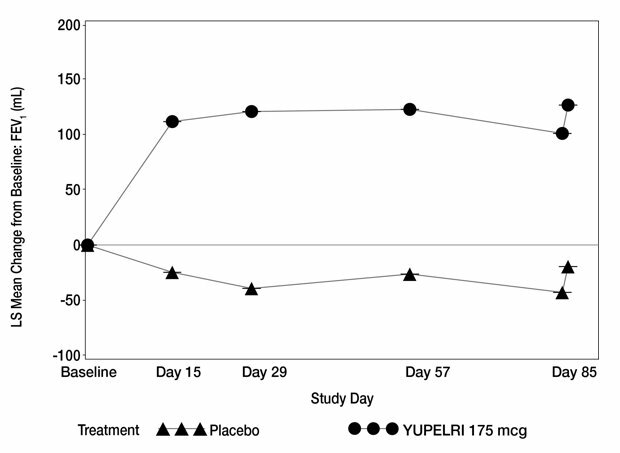 The safety and efficacy of YUPELRI 175 mcg once daily were evaluated in two dose‑ranging trials, two replicate 12-week, Phase 3 confirmatory clinical trials, and a 52-week safety trial. The efficacy of YUPELRI is primarily based on the two replicate 12-week, Phase 3 placebo-controlled trials in 1,229 subjects with COPD. Dose selection for revefenacin was supported by a 28-day, randomized, double-blind, placebo-controlled, parallel-group trial of 355 subjects diagnosed with moderate to severe COPD, which was conducted to evaluate four doses of YUPELRI. YUPELRI 44, 88, 175 and 350 mcg, or matching placebo were taken once daily in the morning via a standard jet nebulizer (PARI LC® Sprint Reusable Nebulizer) and evaluated using the primary efficacy endpoint of change from baseline in trough (predose) FEV1 measured on Day 29. The LS mean differences in change from baseline in trough FEV1 compared to placebo for the 44 mcg, 88 mcg, 175 mcg, and 350 mcg once-daily doses were 52 mL [95% CI: -17.3, 121.0], 187 mL [95% CI: 118.8, 256.1], 167 mL [95% CI: 97.3, 236.0], and 171 mL [95% CI: 101.9, 239.3], respectively. Evaluations of the dosing interval by comparing once- and twice-daily dosing of YUPELRI in a 7-day, randomized, double-blind, placebo-controlled, crossover trial in 64 patients supported selection of the once-daily dosing interval for further evaluation in the confirmatory COPD trials. The dose-ranging results supported the evaluation of two doses of revefenacin, 88 mcg and 175 mcg once daily, in the confirmatory COPD trials. The clinical development program for YUPELRI included two 12-week, randomized, double-blind, placebo-controlled, multiple dose, parallel-group confirmatory trials in subjects with moderate to very severe COPD designed to evaluate the efficacy of once-daily YUPELRI’s effect on lung function (Trial 1: NCT02459080 and Trial 2: NCT02512510). To be enrolled, subjects needed to be 40 years of age or older, have a clinical diagnosis of COPD, a history of smoking greater than or equal to 10 pack-years, moderate to very severe COPD (post‑ipratropium FEV1 less than or equal to 80% of predicted normal values but at least 700 mL), and an FEV1/FVC ratio of 0.7 or less. Trials 1 and 2 included 1,229 subjects of which 395 received the 175 mcg dose administered via a standard jet nebulizer (PARI LC® Sprint Reusable Nebulizer). The study population had a mean age of 64 years (range: 41 to 88) and mean smoking history of 53 pack-years, with 48% identified as current smokers. At screening, the mean post-bronchodilator percent predicted FEV1 was 55% (range: 10% to 90%), and the post-bronchodilator FEV1/FVC ratio was 0.54 (range: 0.3 to 0.7). In addition, of the subjects enrolled, 37% were taking LABA or ICS/LABA therapy at study entry and remained on this concomitant therapy throughout the study. Trials 1 and 2 evaluated YUPELRI 175 mcg once daily and placebo once daily. The primary endpoint was change from baseline in trough (predose) FEV1 at Day 85. In both trials, YUPELRI 175 mcg demonstrated significant improvement in lung function (mean change from baseline in trough (predose) FEV1) compared to placebo. Table 2 presents the results from Trial 1 and Trial 2. The change from baseline in trough FEV1 over time from Trial 1 is depicted in Figure 1.
n=subjects in ITT population used in the statistical analyses. In Trial 1, serial spirometry over 24 hours was performed in a subset of patients (n=44 placebo, n=45 YUPELRI 175 mcg) on Day 84. In Trial 2, similar testing was also performed (n=39 placebo, n=44 YUPELRI 175 mcg). That data for Trial 1 is shown in Figure 2. Peak FEV1 was defined as the highest postdose FEV1 within the first 2 hours after dosing on Day 1. The mean peak FEV1 improvement on Day 1 relative to placebo was 133 mL and 129 mL in Trials 1 and 2, respectively. The St. Georges Respiratory Questionnaire (SGRQ) was assessed in Trials 1 and 2. In Trial 1, the SGRQ responder rate (defined as an improvement in score of 4 or more as threshold) for the YUPELRI treatment arm on Day 85 was 49% compared to 34% for placebo [Odds Ratio: 2.11; 95% CI: 1.14, 3.92]. In Trial 2, the SGRQ responder rate for the YUPELRI treatment arm was 45% compared to 39% for placebo [Odds Ratio: 1.31; 95% CI: 0.72, 2.38]. YUPELRI (revefenacin) inhalation solution is supplied as a 175 mcg/3 mL sterile, clear, colorless, aqueous solution in unit-dose low‑density polyethylene vials. Each vial is overwrapped in a foil pouch and supplied in cartons containing either 30 individually pouched unit‑dose vials (NDC 49502-806-93) or 7 individually pouched unit-dose vials (NDC 49502-806-77). Store YUPELRI in the protective foil pouch. Store at room temperature from 68°F to 77°F (20°C to 25°C); excursions permitted from 59°F to 86°F (15°C to 30°C) [See USP Controlled Room Temperature]. Protect from direct sunlight and excessive heat. The YUPELRI solution unit-dose vial should only be removed from the foil pouch and opened IMMEDIATELY BEFORE USE. The vial and any residual content should be discarded after use. Discard any solution that is not clear and colorless. YUPELRI should only be administered via a standard jet nebulizer connected to an air compressor with an adequate airflow, and equipped with a mouthpiece. Do not swallow or inject YUPELRI. Advise the patient to read the FDA-approved patient labeling (Medication Guide and Instructions for Use) with each new prescription and refill. Inform patients that YUPELRI is not meant to relieve acute symptoms of COPD and extra doses should not be used for that purpose. Advise patients to treat acute symptoms with an inhaled, short-acting beta2-agonist such as albuterol. Provide patients with such medicine and instruct them in how it should be used. Tell patients they should not stop therapy with YUPELRI without healthcare provider guidance since symptoms may recur after discontinuation. As with other inhaled medicines, YUPELRI can cause paradoxical bronchospasm. If paradoxical bronchospasm occurs, instruct patients to discontinue YUPELRI. Instruct patients to be alert for signs and symptoms of acute narrow-angle glaucoma (e.g. eye pain or discomfort, blurred vision, visual halos or colored images in association with red eyes from conjunctival congestion and corneal edema). Instruct patients to consult a healthcare provider immediately if any of these signs or symptoms develops. Instruct patients to be alert for signs and symptoms of urinary retention (e.g. difficulty passing urine, painful urination). Instruct patients to consult a healthcare provider immediately if any of these signs or symptoms develops. It is important for patients to understand how to correctly administer YUPELRI using a standard jet nebulizer [see Instructions for Use]. Instruct patients that YUPELRI should only be administered via a standard jet nebulizer. Patients should be instructed not to inject or swallow the YUPELRI solution. Patients should be instructed not to mix other medications with YUPELRI. Patients should not inhale more than one dose at any one time. The daily dosage of YUPELRI should not exceed one unit-dose vial. Inform patients to use the contents of one vial of YUPELRI inhaled orally daily at the same time every day. Patients should throw the plastic dispensing vials away immediately after use. Due to their small size, the vials pose a danger of choking to young children. Copyright © 2018 Mylan Specialty L.P. Important: For oral inhalation only. Do not swallow or inject YUPELRI. YUPELRI is a prescription medicine used to treat chronic obstructive pulmonary disease (COPD). COPD is a long-term (chronic) lung disease that includes chronic bronchitis, emphysema, or both. YUPELRI is an anticholinergic medicine. Anticholinergic medicines help the muscles around the airways in your lungs stay relaxed to prevent symptoms such as wheezing, cough, chest tightness, and shortness of breath. YUPELRI is used long-term as 1 vial of YUPELRI, 1 time each day inhaled through your nebulizer to improve symptoms of COPD for better breathing. YUPELRI is not used to relieve sudden breathing problems and will not replace an inhaled rescue medicine. YUPELRI should not be used in children. It is not known if YUPELRI is safe and effective in children. Do not use YUPELRI if you have had an allergic reaction to revefenacin or any of the ingredients in YUPELRI. Ask your healthcare provider if you are not sure. See the end of this Medication Guide for a complete list of ingredients in YUPELRI. have eye problems such as glaucoma. YUPELRI may make your glaucoma worse. have prostate or bladder problems, or problems passing urine. YUPELRI may make these problems worse. are allergic to any of the ingredients in YUPELRI or any other medicines. See “What are the ingredients in YUPELRI?” below for a complete list of ingredients. are pregnant or plan to become pregnant. It is not known if YUPELRI may harm your unborn baby. are breastfeeding. It is not known if the medicine in YUPELRI passes into your breast milk and if it can harm your baby. Tell your healthcare provider about all the medicines you take, including prescription and over-the-counter medicines, vitamins, and herbal supplements. YUPELRI and certain other medicines may interact with each other. This may cause serious side effects. How should I use YUPELRI? Read the step-by-step instructions for using YUPELRI at the end of this Medication Guide. YUPELRI is only for use with a nebulizer. Do not use YUPELRI unless your healthcare provider has taught you how to use it with your nebulizer and you understand how to use it correctly. Use YUPELRI exactly as your healthcare provider tells you to use it. Do not use YUPELRI more often than prescribed. 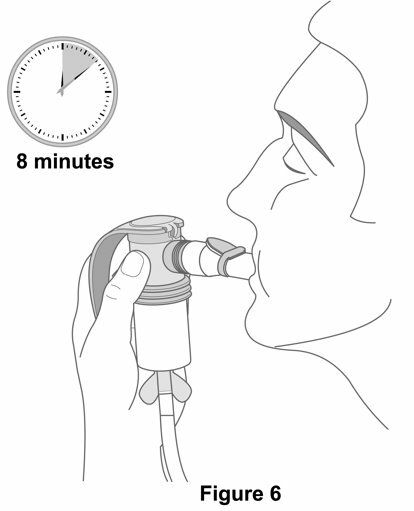 YUPELRI is taken as a breathing treatment (by oral inhalation) and should be used with a standard jet nebulizer with a mouthpiece connected to an air compressor. Do not mix YUPELRI with other medicines in your nebulizer. Use 1 vial of YUPELRI, 1 time each day. Do not use more than 1 vial of YUPELRI a day. If you use too much YUPELRI, call your healthcare provider or go to the nearest hospital emergency room right away if you have any unusual symptoms, such as worsening shortness of breath, chest pain, or increased heart rate. Do not use other medicines that contain an anticholinergic for any reason. Ask your healthcare provider or pharmacist if any of your other medicines are anticholinergic medicines. YUPELRI does not relieve sudden symptoms of COPD and you should not use extra doses of YUPELRI to relieve these sudden symptoms. Always have an inhaled rescue medicine with you to treat sudden symptoms. If you do not have an inhaled rescue medicine, call your healthcare provider to have one prescribed for you. Do not stop using YUPELRI, even if you are feeling better, unless your healthcare provider tells you to because your symptoms might get worse. you need to use your inhaled rescue medicine more often than usual. your inhaled rescue medicine does not relieve your symptoms. What are the possible side effects with YUPELRI? Sudden breathing problems immediately after inhaling your medicine. If you have sudden breathing problems immediately after inhaling your medicine, stop using YUPELRI and call your healthcare provider right away. If you have any of these symptoms, call your healthcare provider right away before using another dose of YUPELRI. These are not all the possible side effects of YUPELRI. How should I store YUPELRI? Store YUPELRI at room temperature between 68°F to 77°F (20°C to 25°C). Store YUPELRI in the unopened protective foil pouch and only open the foil pouch right before you are ready to use YUPELRI. Keep YUPELRI away from light and heat. Throw away the vial of YUPELRI and any leftover medicine after use. Throw away the vial of YUPELRI if the solution is not clear and colorless. Do not use YUPELRI after the expiration date provided on the foil pouch and vial. Keep YUPELRI and all medicines out of the reach of children. General Information about the safe and effective use of YUPELRI. Medicines are sometimes prescribed for purposes other than those listed in a Medication Guide. Do not use YUPELRI for a condition for which it was not prescribed. Do not give YUPELRI to other people, even if they have the same symptoms that you have. It may harm them. You can ask your healthcare provider or pharmacist for information about YUPELRI that is written for health professionals. What are the ingredients in YUPELRI? For more information about YUPELRI, go to www.YUPELRI.com or call 1-877-446-3679 (1-877-4-INFO-RX). YUPELRI is used only in a standard jet nebulizer machine with a mouthpiece connected to an air compressor. Make sure you know how to use your nebulizer machine before you use it to breathe in YUPELRI or other medicines. YUPELRI comes in a vial that is sealed in a foil pouch. Do not open the sealed pouch until you are ready to use a dose of YUPELRI. Use your YUPELRI right away after opening. Read the following Steps before using YUPELRI. If you have any questions, ask your healthcare provider or pharmacist. Step 1.Open Pouch: Open the foil pouch by tearing along the seam of the pouch. 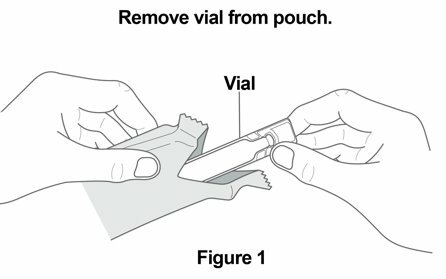 Remove the vial of YUPELRI from the foil pouch (Figure 1). Step 2. 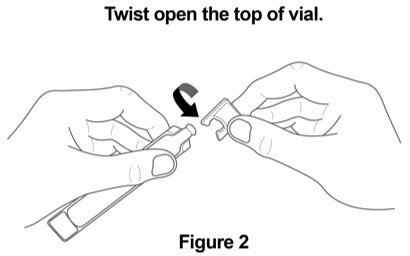 Open Vial: Carefully twist open the top of the vial and use it right away (Figure 2). Step 3. 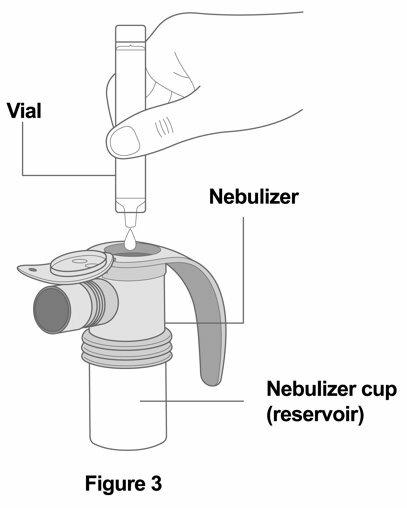 Add Medicine: Squeeze all of the medicine from the vial into the nebulizer cup (reservoir) (Figure 3). Step 4. 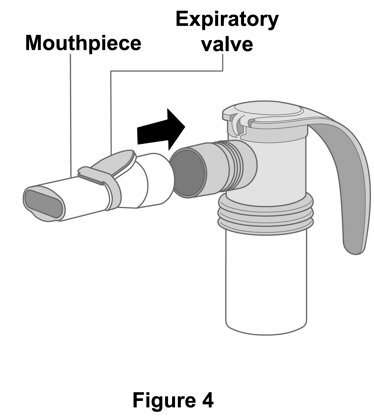 Attach Mouthpiece: Connect the mouthpiece to the nebulizer cup (reservoir) with the expiratory valve facing up (Figure 4). Step 5. 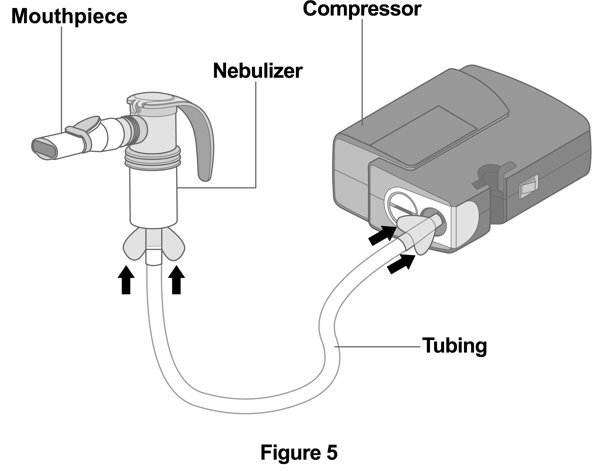 Connect the Nebulizer to the Compressor: Firmly insert one end of the tubing to the compressor. Insert the other end of the tubing to the bottom of the nebulizer cup (reservoir) (Figure 5). Step 6. Prepare for Treatment: Sit in a comfortable, upright position. Place the mouthpiece in your mouth and close your lips around the mouthpiece. Step 7. Begin Treatment: Turn on the compressor to begin your treatment (Figure 6). Step 8. Breathe in Medicine: Breathe as calmly, deeply, and evenly as possible until no more mist is seen in the nebulizer reservoir. Your treatment will take about 8 minutes. When you do not see any mist in the nebulizer, your treatment is finished. Turn the compressor off. Step 9. Clean Nebulizer: Clean and store your nebulizer. See the manufacturer’s instructions that come with your nebulizer for how to clean and store your nebulizer. solution containing sodium chloride, citric acid and sodium citrate. from 59°F to 86°F (15°C to 30°C) [See USP Controlled Room Temperature]. Keep out of reach of children. Not a child-resistant package. Copyright © 2018 Mylan Specialty L.P. All rights reserved.